Recent research elsewhere in this country has thrown some light on the initials In Brynlow. 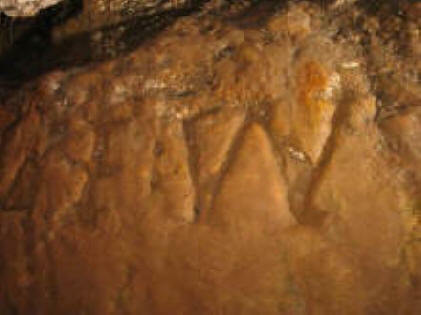 The marks which appear as JW (the J as a crossed-I) are alongside the date 1764 in a coffin-level in Brynlow Mine. Based on the history of Charles Roe’s mining, we had assumed they stood for Josiah Wagstaff although an alternative view was Jonathan Wright as the same initials appear on Topps Farm. However, research into the graffiti in buildings and caves has suggested a strong link with so-called ‘apotropaic’ or more commonly ‘ritual’ marks. These are inscriptions intended to ward off evil spirits. 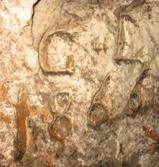 The belief of researchers is that the two letters J and W represent Jesus and the Virgin Mary (V V: sometimes crossed) and their discovery in places such as Wookey Hole and Goatchurch Cave in Somerset and in Ease Gill Kirk Cave in Yorkshire support this. Why mark them in Brynlow? It might have been JW's vanity but could it have been that the miners had reached a point in the excavation where they intersected the Bronze Age pits and were worried about the 'natural' void they had met? It is particularly interesting that in Wookey Hole, the marks are often found below natural chimneys (avens) in the cave. 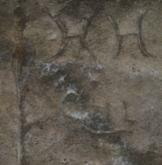 The articles consulted (see below) also suggest that the marks are common on buildings, often mistaken as mason’s marks. So it would appear that Alderley Edge may have another small claim for fame in being a mine site with these marks. Incidentally, mining graffiti certainly does exist as the two pictures below clearly show. T. Lord and J. Howard, Cave Archaeology in A. Waltham and D. Lowe (eds.) Caves and Karst of the Yorkshire Dales (Volume 1) . 2013 Buxton: British Cave Research Association.